The Paleo Diet and the Question of Cooking at El Sidrón Boils Down *cough* to n-alkanes. Who Could’ve Predicted? I’m talking about the Neanderthal dental calculus chemical characterization undertaken by Stephen Buckley, and which was published under the title of ‘Neanderthal Medics?’ [catchy title] by Hardy et al. 2012. Certain organic compounds led the authors to infer that cooked vegetables were the source. Neanderthal chefs? So, I went to check. There they were. Branching alkanes. 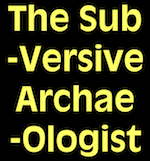 [Who’d’ve thought this archaeologist would one day find himself talking about branching organic molecules?] Undaunted [or so I’d want Stephen Buckley to believe] I soldiered on. And, my perseverance paid off. I wasn’t imagining it! That pesky wasp was making n-alkanes, too. ‘What a trooper,’ I thought to myself [more concerned, this time, that I was personifying a wasp than that I was talking to myself again]. I have the proof right here. And, it’s even more exciting than I thought it was the first time! Immediately below I’m reproducing the table showing the actual values, by weight, of each of the compounds that were found in the wasps’ Dufour glands. BEFORE you go all weird about the size of the type, chill. The table is just for show. I’ll extract the important data for you. But don’t be surprised by the miniscule quantities reported. Wasps are small, mind you. 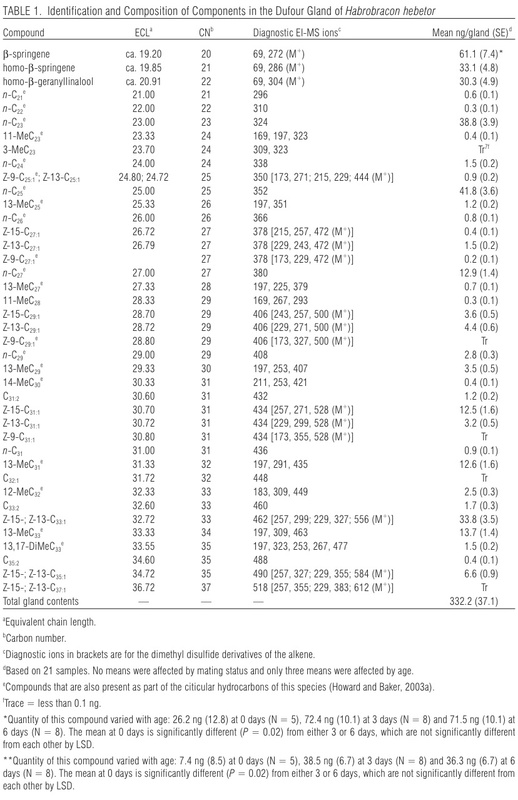 So their little Dufour glands don’t hold much of anything–according to this table, ~332 nanograms of organic compounds [that’s billionths of a gram to the SI-challenged among you]. The truly gloatable bit from this table is that ~30% of the stuff in each gland comprises…you should be sitting down, Stephen…n-alkanes. They run the gamut from n-C21 through n-C31. 30% by weight! Wriggle out of that one, Mr. biochemically savvy El Sidrón dental calculus man! I’d like to acknowledge the patience and persistence that you’re demonstrating, Stephen, in this protracted conversation with a total know-nothing-about-organic-chemistry type. Thanks. As for the other stuff–philosophy and absent evidence and all that–maybe some day soon we can sit down over a pint No! a Pimms No. 1 Cup in the back garden at the Wheat Sheaf in Oxford. That’d be perfect. Later. This entry was posted in alkanes, cooking hypothesis, El Sidrón, insect paraffin, Oxford, Pimms No. 1 Cup, Stephen Buckley, Wheat Sheaf. Bookmark the permalink. Er…, I've no wish to wriggle out of anything, but you are right Rob, that insect waxes contain significant amounts of n-alkanes – 30% in the case you cite, as you say. The 'problem' is the fact that this same wax (and typical of insect waxes) is also accompanied by 31% of branched alkanes, according to the table (so about the same). IF it was an insect wax in the dental calculus of the El Sidron Neanderthals then we would also expect to see significant amounts of branched alkanes TOO. The fact that branched alkanes are absent and we ONLY see n-alkanes IS typical of 'boring' plant waxes, but NOT the 'crazier' insect waxes, where their chemistry is much more interesting (well to me, anyway…!). One could try to suggest that the branched alkanes degrade much more easily compared to the n-alkanes, so it could still be an [albeit degraded] insect wax. Unfortunately, that's not the case; they degrade at a similar rate and are normally fairly resistant to decay (this 'diagenesis' is a key part of our approach). IF this wasn't about Neanderthal diet there would be a general agreement between the scientists on 'plant'. But of course it is! I would say that scientists like myself SHOULD be questioned about our results, rather than be seen as 'all-knowing beings' [we're NOT! ], and people swallowing the science whole – this DOES happen far too often. We find true understanding by asking 'why? ', NOT by looking at how big the name is and deciding whether to 'trust it'. In this respect, I'd like to thank Rob for questioning the science. Science can be powerful, but it is certainly not infallible, and nor does it have all the answers. In my PhD thesis (some time ago now) I had a quote I felt was apt – 'Believe those who are seeking the truth; doubt those who find it.' (Andre Gide). Indeed!